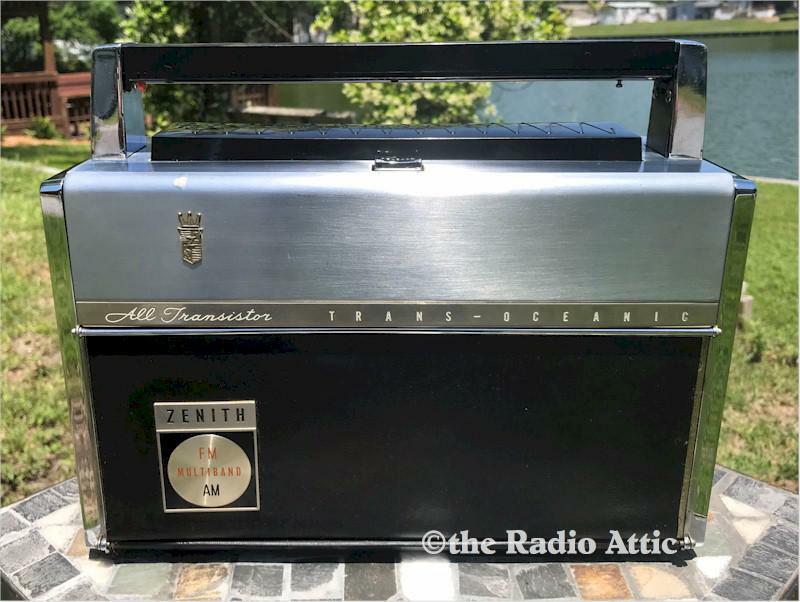 This is a dynamite playing Zenith Trans-Oceanic 3000-1 with an almost pristine case. There is one small blemish on the front left side of the top door. The sides have no creases. Inside the case a little wear around the dial knob. Battery box and Logbook are pristine. It plays like no other on AM/Shortwave and very good for a 3000 on FM. Very little alignment was needed. The radio is not just serviced which replaces some electrolytic capacitors. It is restored with all new electrolytic capacitors which will allow the radio to play another 40 years like new. You can buy an AC adapter on eBay but I have found some of them interfere with AM and some Shortwave. Radio Shack had an excellent one but they are out of business. It is actually better for the radio if you put batteries in it to play. One year warranty. The radio will be shipped back to you by USPS Priority which only takes 2-3 days. Read some of my feedback on eBay under Hammer39. You are visitor number 1,158 to this page.